I thought I'd at least take a short break in order to share with you some amazing cookies I made earlier this week. Actually, this is a recipe I've been meaning to try for more than a year. Oh My Goodness!!!!! It is everything everyone has always said it was! These Chocolate Chip Cookies are absolutely in-cre-di-ble! And you know what's the best part? They don't even need dehydration so you can whip 'em up whenever the craving for a sweet treat hits you. Man, is there an end to all those scrumptious creations? I sure hope not! 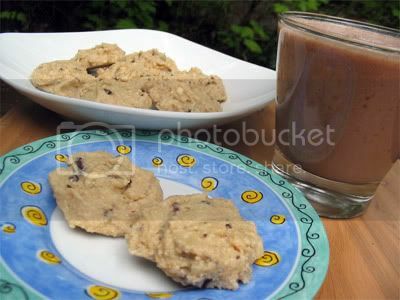 1 3/4 cups cashew "flour"
Blend 1/2 cup coconut oil, 1/2 cup carob, 1/2 cup cacao. Put mixture in freezer, then chop into chunks. In a large bowl, mix Cookie Batter ingredients by hand. Form into balls, roll in cashew "flour" and refrigerate. mysticat.....GENIUS---PURE GENIUS with the chocolate chip cookies!!!!! They are out of this world!!!!! the cashew flour is what really made the cookies! a few modifications that i did---i used all cashew flour, used all cocoa and added agave to the choco chip mixture until it was "bittersweet". I think i will use less oil next time and it was a little bit oily for my liking.....BUT HOLY SMOKES WERE THESE GOOD!!!! i couldn't stop snacking on the batter and then i had to put in the freezer to let the choco harden up a bit so i can form them into balls! I made the chocolate chip cookies and they are AWESOME! I didn't roll them in cashew flour and I ended up putting them in the dehydrator...they were warm, soft and chewy and the chocolate chips were so close to the SAD ones it was scary! ~ I used both oat and cashew flour and 1/4 cup coconut oil instead of 1/2 cup. ~ I used chocolate pieces I had sitting in the freezer, made with cacao paste and agave. ~ I just dropped the batter by the spoonful on a parchment paper. I'm all for simple! Enjoy with almond milk or Eva's yummy Cacao Mylkshake! Love your blog :) I've tried a lot of your recipes out and they are always out of this world!! Thanks for sharing your delicious treats with us. This recipe looks amazing and i can't wait to try it out...but I have a few questions first. 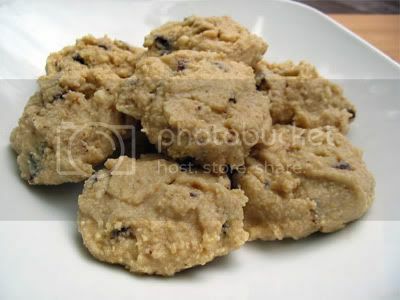 How do I make the cashew and oat groat flour? Do i just grind them up in my coffee grinder? Do I need to soak the oat groats first? If so, for how long? To make the cashew and oat flours, simply grind them dry in your coffee grinder or high speed blender. I just made these! My adjustment was to add a pinch of salt to the dough to balance out the sweetness. I also think these would be great with raisins and/or walnuts instead of the choc. chips - but hey, who doesn't like chocolate chip cookies, right? Yes please....I'd like a cookie. :) I'll be picking up some cashews soon. I have no doubt these are snarfalicious! Hi Carmella! I love your blog! I'm a newbie and was wondering, to make the carob chips, are you using carob powder or nibs? (As you may be able to tell, I have never used carob before). Also, can you give us the recipe to make the cacao paste? That sounds like it would make awesome choc chips! Thanks! You can totally use cacao nibs instead of chocolate/carob chips. I personally use a mixture of cacao and carob, say ratio 3/1 or even half of each. The cacao paste you must buy online (see this post for more info). To make chips with it mix with agave nectar. The look so heart warmingly good! I am going to make these forsure :) Thank you! i wish i could just pop a few out of my computer monitor and eat 'em. they look just delicious. i'm starting with making the choco chips first. i'm going to stop by nature's first law to pick up some oat groats and cashews. thanx for this recipe. did you create it? do you have a recipe for raw oreo's? i've really been craving them. the sweetness with the crunchiness and icing filling! I'm curious to find out how these will turn out if I supplement dehydrated fruit or stevia leaves in place of the agave. If you beat me to the test, let me know how it turns out. Could you explain how to make cashew flour. Thanks!! To obtain flour, simply grind cashews (or oat groats) up in a coffee grinder or high power blender. I'm new to raw food, and I have to say your recipe sounds really good. But I also have a question: if you put that chocolate chip stuff in the freezer, doesn't it denaturate and by that not be raw anymore?